Card games have existed long before Hearthstone came around, and will exist long after it is shut down, however many years away we are from that point. But there’s no denying that some titles lift a little too generously from Blizzard’s recent cash cow, almost to the point of creating a new “Hearth" subgenre. That’s basically what Kung Fu Panda: Battle of Destiny (Free) does, but with more…erm…pandas. Wait Hearthstone already has pandas! Well this has…Mr. Ping and a few lines from Jack Black. For a licensed game, Battle goes a little further then I thought it would. There’s a few tidbits of dialogue to get you started, followed by a decent amount of art both from and inspired by the film franchise. Like I was saying above, there’s another major inspiration afoot here, as the game essentially operates like Hearthstone, with a few twists. 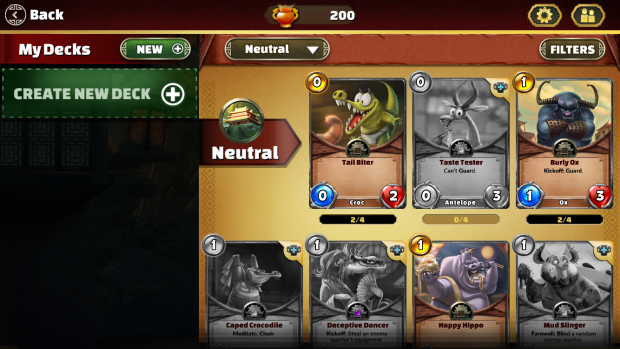 Cards have a health and attack rating, special rules (that spring with various times like when the card is played, just like Battlecry), heroes have a designated health rating, and there’s even a numeric mana pool that starts at 1 and increases every turn. Heck, the second player gets a token for an extra mana. The twists are slight but interesting enough. Now instead of relegating only a few heroes to direct attacks, every character can attack. This mixes things up a bit as you’ll always have something to do, but it does homogenize the roster. One of the better formula updates though is the guard maneuver, which allows any minion card to gain taunt by dragging it to your avatar. Furthermore, minions can attack the turn they are played (with a few exceptions like the “meditate" rule on select cards), making it a more fast-paced affair. There was a point in my playtime where I was teetering between how shamless the whole affair was, and how well the team actually crafted a competent card game. Ultimately I tended to feel more comfortable with the latter, as I continued to wrack up more cards and learn the inner dealings of how some of the cards worked. I’m not sure if I’m going to start amassing a giant collection anytime soon, but it’s fun. So what is there to actually do? Of course there’s daily quests for gold bonuses, and options to battle CPUs and humans. Sadly, draft mode and online PVP are “coming soon." You’ll need to link your Facebook account for maximum reach, but you can provide as little information as possible and the app doesn’t post to your wall by default. 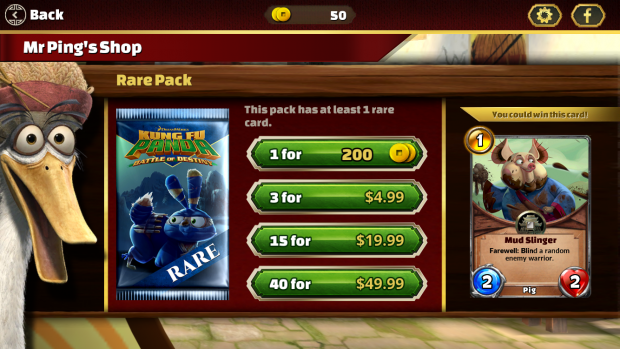 There is a shop, and players can buy packs of cards for 200 in-game coins, or in bulk for straight cash. Like its main competitor it’s entirely possible to play (and win) off basic decks, though if the platform lasts long enough (who knows) balance issues may creep up at some point. The blow is softened by the lovable Mr. Ping, who runs said shop. 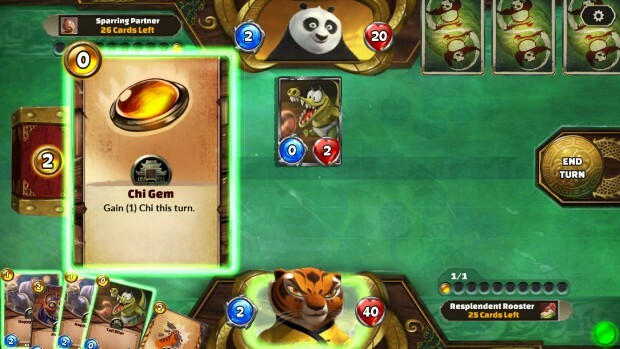 Kung Fu Panda: Battle of Destiny may be offensive to Blizzard, but it’s a rather inoffensive alternative for card game fans. I ended up playing it far longer than I thought I would, and there’s even a few bits that Blizzard can probably benefit from.